The touch of you burns my hands…. As you can see from the photo, ice is a gorgeous glass forest, growing over the window as I write my last post from Alaska for a while. Ice seems alive, like a colony of arctic coral, a frozen entity with a single plan: to spread its exquisite, crystalline translucence. Over everything if it’s cold enough, which it is here. Sometimes ice is so beautiful it scares me because I know it can also kill. This afternoon, Goomanita (the co-grandma of our two darling grandboys) and I drive out in the Subaru to pick up r at school. The ice fog, frozen microbits of ice hanging in the air around us, and the air we breathe, is so dense we must braille our way along at 5 mph. Then, of course, the road itself is a slick crust of snow over ice. If I hadn’t already memorized its heaves, curves and edges we’d have surely ended upside down in a ditch or slammed into one of the walls of ice encrusted willows that line the road. You never know around here. In town, when we stop to fill up with gas I make the mistake of not putting on my gloves. It’s -25 °F, but I hate covering up my hands and ignore the ice coating the nozzle and when I lift it the HEAT! of the ice burns my hand so badly I drop the nozzle and shriek a profanity that won’t be shared here. Ice is not always nice. And yet, just about then we both look up because overhead something so blindingly bright is taking place that we drive up the hill to the University of Alaska for a photo. 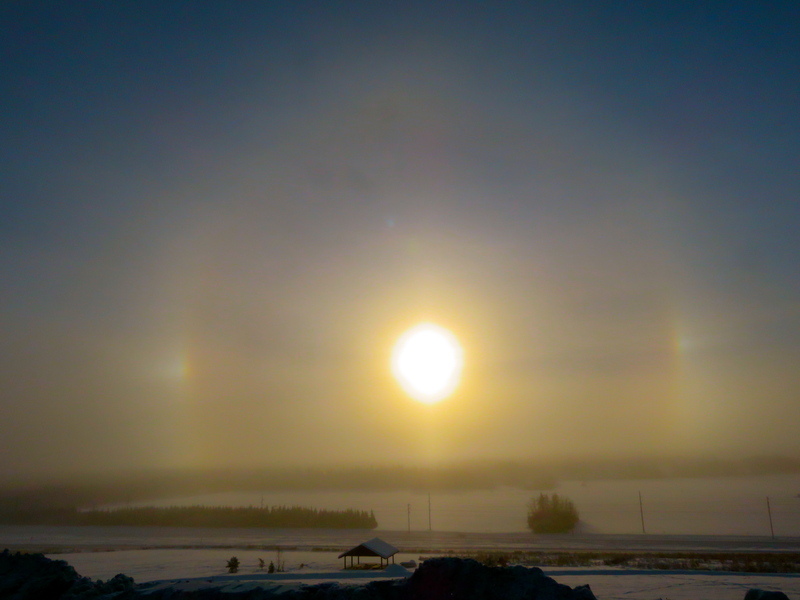 A parhelion, which some folks call “sun dogs” because of the two shimmering balls of light interacting with ice crystals off to each side of the central sun, explodes through the ice fog like the Eye of God. Parhelia always bring me to tears. They are huge, appear suddenly, intensely right on top of you and alter forever how you feel about your own personal power. You have none. As least that’s how it is for me. I want to bow, to shout “Hallelujah!” to the force that can create such a majestic display of light and ice. 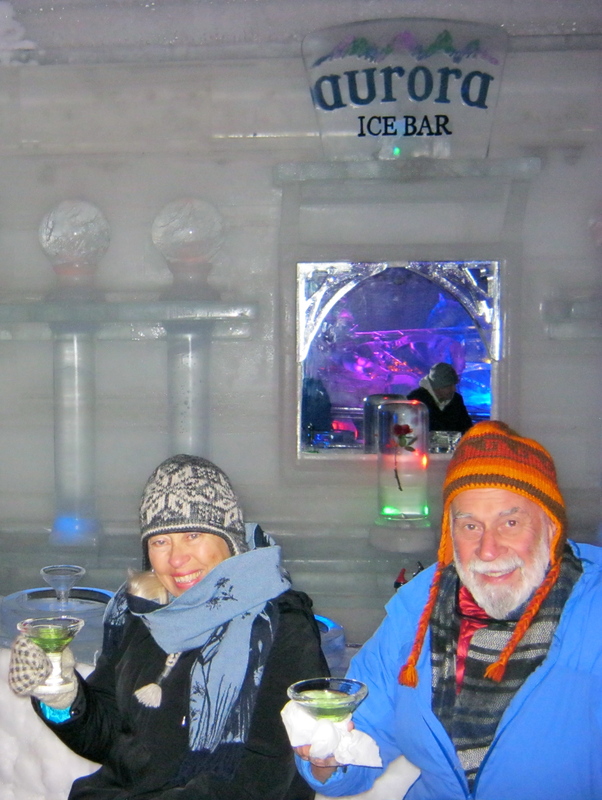 More to the point, I want to toast the grandeur of all icy things with an appletini in an goblet made of ice, like we had last year out at the Chena Hot Springs Ice Museum, a marvel completely built of ice. So does Anita; she’d been there, too. But I am driving and we’re on our way to pick up r, so we satisfy ourselves with a couple of “Wows!” and head back down the hill. 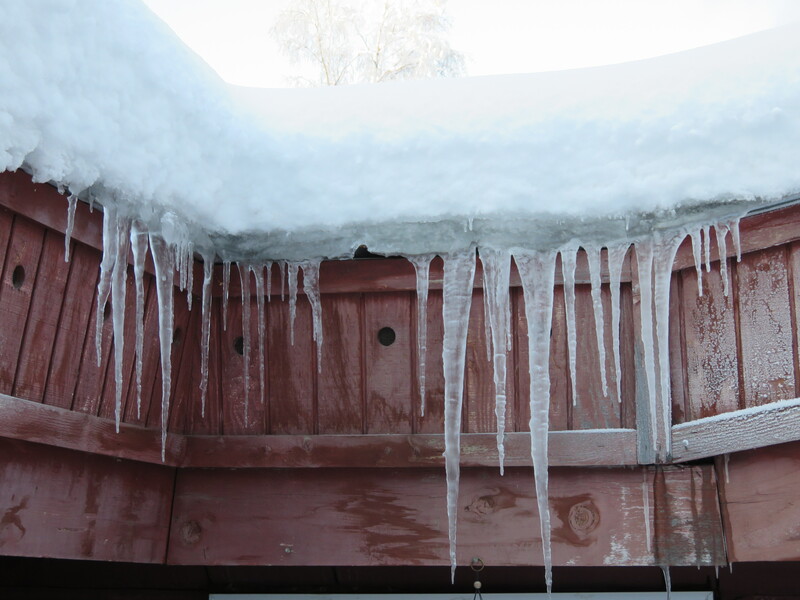 The roof at r’s school greets us with pendants of ice in one of its more familiar forms hanging close to the door through which the little guys, bundled in their snowsuits, mittens and boots, actually run outdoors to play, unless it’s below -20 °F. That’s considered too cold even for Alaskan kids. I have this awful fear each time I walk near these icicles that one of them will break off and impale my brain, giving me an instant lobotomy. Worse…what if it were a kid’s head? Nobody else seems to notice or care, though. 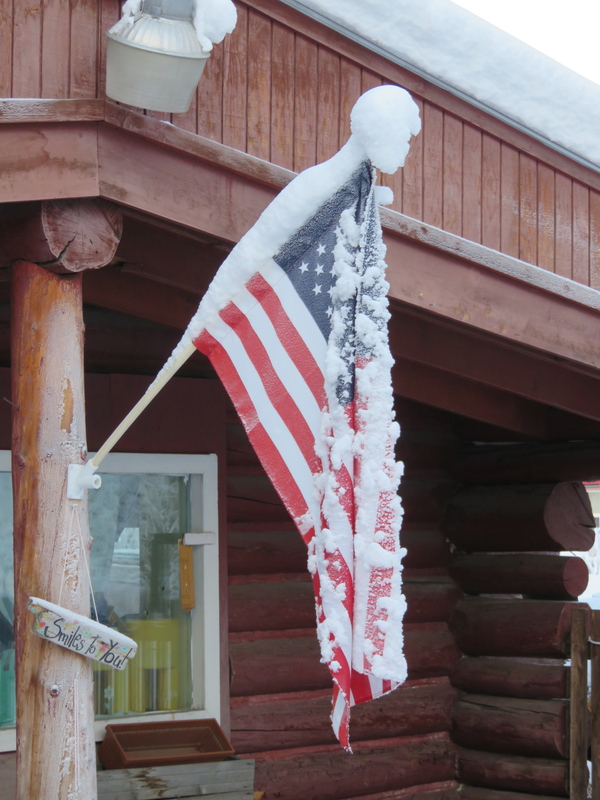 Nor do they notice how the American flag hangs stiff, frozen, lifeless near the entrance. I don’t usually notice the flag at all anymore, but now I want to remove it gently from its holder, carry it inside, de-ice it with a hair dryer if they’ve got one, fold it up and tuck it away until summer when the 23+ hours of daylight, the gentle breeze and 9,000,000 mosquitoes will energize this symbol of American greatness. But maybe it’s a law that even frozen U.S. flags must fly hang. We’re on our way home. Little r’s in the back, strapped into his car-seat and drinking apple juice out of a Teenage Mutant Ninja Turtle bottle. 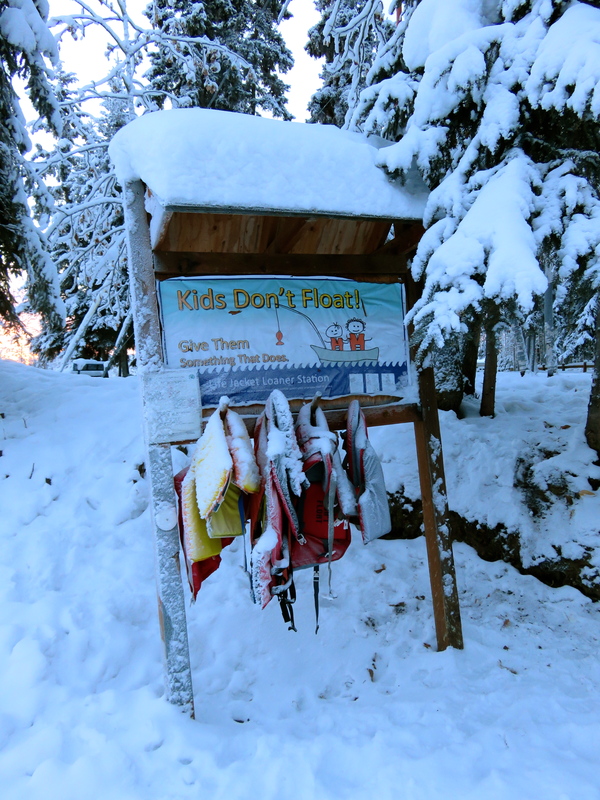 We decide to check the Chena River for ice before our nap. The local Athabaskan word for ice is łut, but river or lake ice is tenh. That’s what we’re looking for. We head down Chena Small Tracts Road; it ends at a boat launch next to the river. A sign, covered with ice and an important message, sits right at the edge of the ramp, which is also frozen. It turns out I’m the only one who wants to check the tenh; everyone else is too cold, too sleepy, too bored with ice. I leap out of the car, but keep it running so Anita and r can stay warm and, sadly, I realize I’m contributing to the horrendous pollution problem in the area. I walk down to the river, normally covered with 4+ feet of ice this time of year, and look around. 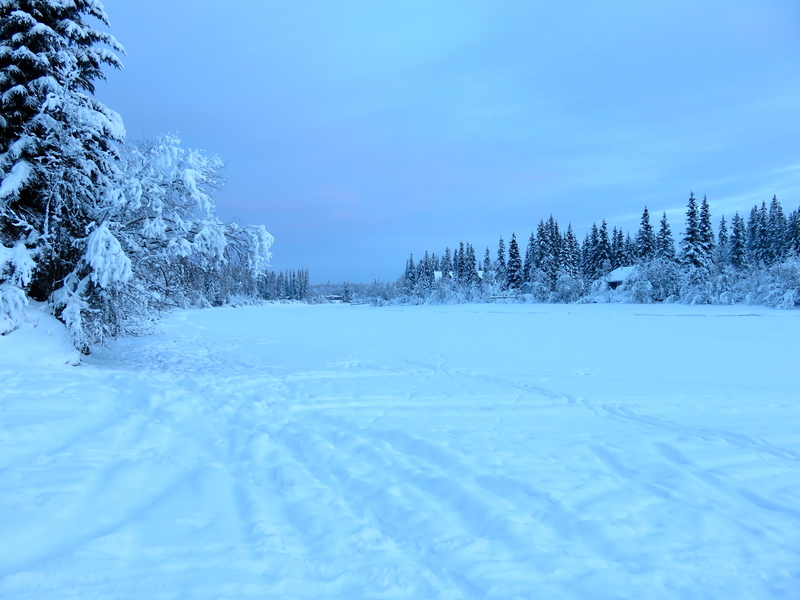 The Chena seems frozen enough and there are a few sled, dog, and ski tracks on it, but looks can be deceiving. I’ve heard it’s been too warm this winter to trust the thickness and most locals have been staying away. Falling through ice is an adventure people from this part of the planet don’t want to have. 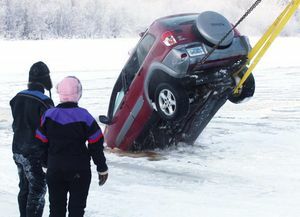 Last year, Alaska State Troopers rescued a 20-year-old woman who was found standing on the roof of a RAV4 stuck in the river. When they were finally able to pull out the car, a dead black labrador was found trapped inside. And there were other incidents, as well. 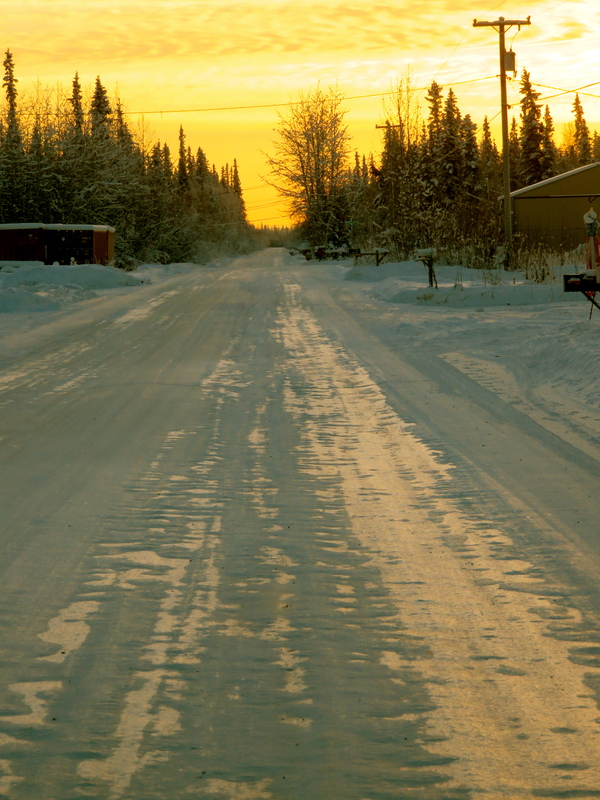 The ice fog lifts like a small grace as we enter our home road and the golden glow of sunset reflects on the ground ice. Unlike many Alaskans who hang out here for the full winter, I’m going to miss the Interior’s icy incarnations as I drive through my sweet Pacific Northwest town, wipers whooshing rain off the windshield without even a hint of ice. I especially love the first photo, Susan. 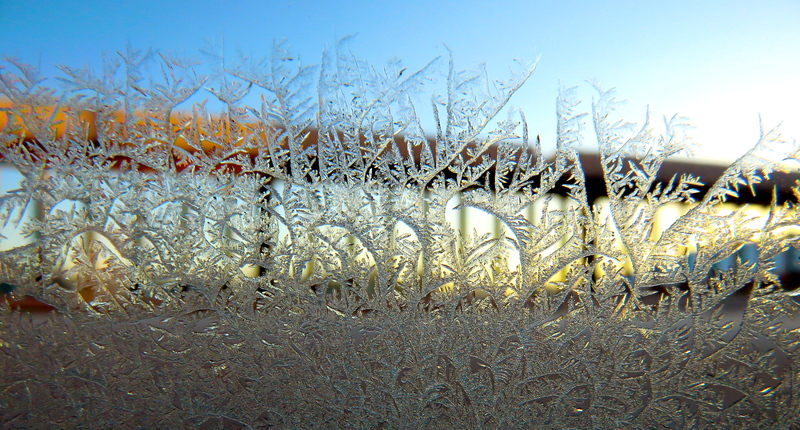 At first, I thought the ice patterns on the window were frozen blades of grass. I’ve never been to Alaska but from what I’ve read and seen, it is a land that does not hesitate to remind it’s inhabitants who is really in charge…man or mother nature. I suddenly feel the need to go warm up by a roaring fire. Yes, Jeff, you’re so right. Alaska is massive, not only in terms of size, but in awesomeness of temperature, light, water, flora and fauna. The people are bigger than life, as well, and build lots of fires. I want to see a sundog sometime before I die. Amazing! May your wish come true, Jilanne! Thanks for sharing your world– makes our lower 48 complaints about weather look a bit meek in perspective. I don’t think kids play outside here if it’s below freezing, let alone below -20. Can’t imagine it. Strangely, Lisa, once you’ve experienced negative 40, -20 doesn’t seem so daunting. Of course, being a kid out playing in it or waiting for the school bus isn’t great fun. Then there’s the issue of young girls not wanting to bundle up because they think it makes them look fat. Really. So they wear only a shirt or sweatshirt. I see that all the time. Dangerous! Thanks for stopping by. Part poetry, part journalism, part encyclopedia—and cultural study—I felt like I got an education–along with being swept up in your crystal clear narrative voice. Thank you for taking the time to do this. Thank you, jd. Those are kind words, and I’m pleased that you came along for the ride. I’m seeing a whole new experience and world through these posts. “Sun dogs” sound like Egyptian throne protectors. Fascinating! Ice like a colony of arctic coral. I love it! And am familiar with sun dogs but only as fragments. Thanks for the new terminology! Gorgeous photos..whew that first one! Will miss your Alaska observations! Travel safe. Susan, thank you for sharing the beauty of Alaska. Your photo’s are wonderful. I’ve been as far north as Sitka, but then Sitka weather is much like weather here in Seattle. I have family in Sitka. Hi E.W. and thanks for stopping by. I’m so pleased you’re enjoying my photos. It’s just so mind-boggingly gorgeous up here that I can’t go anywhere without my camera. I have a friend from Sitka and from what I’ve heard and seen, it’s spectacular, but then so is our Pacific Northwest, eh? Breathtaking photos mixed with humor, wisdom, and love – it’s always a wondrous adventure to read your stories, Susan. Carol, I’m so glad you enjoyed Ice Du Jour. It was my last Alaskan post for a while and I’m gonna miss the frozen north bigtime. Tomorrow, I fly to Taiwan to celebrate Chinese New Year with my son (he lives there), work on a book of poems set on that beautiful island, and write a few blog posts. Exciting! I do understand loving the “frozen north.” I missed the north country when I lived in other places, although Duluth isn’t as far north as Alaska! It’s amazing how you make even bitter cold look beautiful and magical! Some of these photos are divine. The lab in the car… not so beautiful, of course. I know you will miss your babes, but B’ham will be happy to see you! That said, I will miss your lovely Alaska inspirations. So happy you see the beauty and magic in ice, too, Dawn. You’re right about missing the wee ones. My time with them seems dreamlike as my son and I walk through the bustling streets of Taipei. Did you fly directly to Taipei?? Man, you sure are making the most of “retirement!” The next phase is clearly glorious! I dropped down into the Ham for a couple of wildly busy days, then shot overnight to this island where my precious son has lived for 10 years. I am a lucky mama. Life is very sweet! Thanks, snow…. Nature is highly creative during the Alaskan winter! Gracias Q! Diggin Ur parlance! Cold as in Finland in winter. Happy Sunday!